Most of the successful eCommerce websites have some common attributes: a responsive web design, an active social media presence, and a strong focus on the shopper’s overall experience. However, none of this would be as successful if not for key search engine optimization (SEO) strategies. Too many eCommerce sites use the manufacturer’s descriptions for their products and miss out on a great opportunity to hook their visitors. Creating unique product descriptions allows you to entice the customer into buying certain products and also gives them an idea for the tone and feel of your store. Use keywords that your specific audience might search for, but also make sure to avoid keyword stuffing. Another thing to avoid: duplicate copy. It may seem tempting to copy and paste, but your eCommerce site will suffer because of it. Want to be ranked higher in the search engines? Make your site easy to navigate for users, and they will be more likely to hang out on your website for a longer time. This will not only increase your chances of making a sale, but it will also help search engines index your website’s key content and rank you higher. On the other hand, poor navigation can hurt your rankings and will no doubt frustrate online shoppers. Every website, whether it is an eCommerce site or not, should have internal linking. Simply put, internal linking is when you link one page to another within your own website. The content that you are linking to should be relevant, as this will give those who visit your website a better experience, and it will allow you to rank higher in the search engines. Both internal and external link building should be used together in order to be most effective, but many websites forget the importance of linking within their own website. How your eCommerce site handles products that are out of stock has a big impact on SEO. If your product is out of stock, and you plan on replenishing the product, it would be a good idea to provide a message that says “temporarily out of stock” and give the user the option to be notified when it is replenished. If the product will not be replenished, you can redirect visitors to a similar product or back to the homepage, if nothing else. Making your eCommerce site secure will give it a small but significant ranking boost in Google search results. This is because Google decided in 2014 that they wanted to encourage all website owners to keep everyone safe on the web by switching from HTTP to HTTPS. However, the second major version of the HTTP protocol known as HTTP2 has arrived, and it could impact your SEO in the future. Even if it doesn’t affect your search rankings, this new protocol will make your website faster and give users a better experience. Optimizing your images on your website will help users find your products more easily. This is because many users are using the image search function to locate products online. You can do this by putting relevant keywords into the ALT tags of most your images (some images are purely for design purposes and don’t need them). Avoid putting too much content and keywords into them, as this could hurt your rankings. The key is to help users find these products by providing a helpful description. Product reviews are not only vital for SEO purposes, but they can also convince online shoppers to purchase products from your eCommerce site. A survey conducted by Dimensional Research found that 88 percent of participants have been influenced to purchase a product because of an online customer review. Product reviews do well in search engine rankings because they provide unique content for your site, and they improve a user’s experience. An eCommerce website can have amazing products, but this won’t do much good if people don’t know about them in the first place. 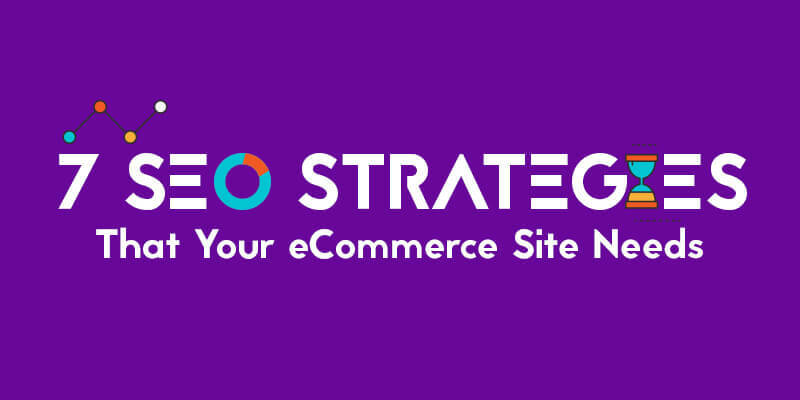 That’s why it is critical that eCommerce websites use SEO strategies, such as the ones mentioned above, to be successful. The Commerce Shop can help you optimize everything—from text and images, to overall design, so that you can convert more online shoppers and maximize sales.